The 1980's saw the World Wrestling Federation (WWF) well on its way towards consolidating and nationalizing what had, for many decades, been a regional business. Though other promotions were still somewhat plentiful well beyond the 80s, WWF and its chief competitor, the NWA or National Wrestling Alliance were the two major players in the industry. Much of the talent assembled on each respective promotion's roster was culled from these lesser known promotions; they essentially served as farm systems for the big leagues that were WWF and NWA. This resulted in an explosion of talent and popularity for professional wrestling, effectively turning the 1980s into wrestling's golden age. During this time Ric Flair served as the embodiment of the NWA while Hulk Hogan was the face of the WWF, and by extension, professional wrestling. And this is how many, especially the casual wrestling observer, view the WWF of the 1980s. In fact, though Hulk Hogan is no longer affiliated with WWF (WWE) he still looms large as the most recognizable face of the company and the industry. Yet, while he was ascending to the position as top man in the company, his rise was being aggressively paralleled by a high flying, crazy eyed, riddle speaking, wild haired talent known as Macho Man Randy Savage. Randy Savage would go on to WWF success that, for its time, was overshadowed only by that of Hulk Hogan. An excellent career, to be sure, but one that was unfortunately stifled by Hogan's continued reign at the top of the wrestling food chain, sustained by multiple title runs. Macho Man was often left to play second fiddle while the Hulkster was on one of his extended title runs. Though he was the clear number two in WWF at the time, Savage competed as if he, not Hogan, was WWF's top man. His superior in-ring work and equal if not better ability to cut a promo allowed Savage to frequently steal the show, most notably at Wrestlemania III, where his match against Ricky "The Dragon" Steamboat would become an instant classic, and what many consider to be the greatest match in wrestling history. 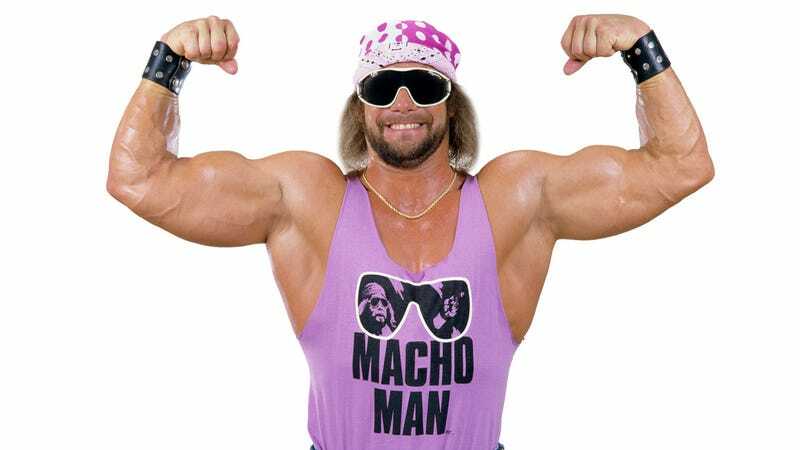 Fortunately, one year later, Macho Man would have his time in the spotlight as he went on to win an elimination tournament for the then vacant WWF World Heavyweight title. Not one to miss out on too much spotlight, Hogan played a prominent helping hand in Savage's victory. Macho Man was able to make the most of his time at the top, holding the title as WWF champ for 371 days before relinquishing his belt to none other than Hulk Hogan at the following year's Wrestlemania. While never being able to fully or permanently eclipse Hogan's place in the WWF hierarchy, Savage is all but unanimously regarded as the better wrestler and performer, and in fact as one of the best of all time. His in ring ability was ahead of its time in its technicality; winning matches by thundering down on opponents with a devastating elbow drop from the top ropes or striking, fast as lightning, with a well timed small package to put his adversary away before he knew what hit him. Randy Savage was the WWF's true Super Star, and all around greatest 80s talent. One need look no further to the WWE's modern era to see how far reaching his impact has become. The style Savage championed has become the baseline for what modern wrestlers need to do to be considered successful. It is a legacy that perfectly befits his legend. Of course, the story doesn’t end here. Though F. Scott Fitzgerald famously said “There are no second acts in American lives” professional wrestling is an entirely different beast. After a second successful run as WWF champion, Savage would fade from the main event picture, going on to do color commentary work before finally departing the WWF, taking his Macho Madness with him to its still biggest rival, World Championship Wrestling (WCW). While in WCW the Macho Man most famously feuded with Ric Flair, in a continuation of their WWF battles. The two would trade the WCW World Heavyweight Championship back and forth during this time. As with his time in WWF, much of Savage’s run in WCW was overshadowed by the presence of Hulk Hogan. In WCW Savage had to compete for main event time with not only Hogan, but also Sting and Flair. Again his talent and charisma allowed him to succeed and excel. The Macho Man would finish his WCW career as a 4 time World Heavyweight Champion. Rightfully remembered as a WWF all time legend, Savage could have retired as wrestling royalty, however the accomplishments of his second act surpassed his already hall of fame caliber career. His already impeccable WWF resume was now equaled by his stellar performance with WCW.